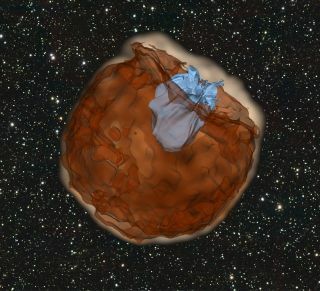 A visualization of a computer simulation of a Type Ia supernova. Ejected material (brown) from an exploding white dwarf star crashes into its companion star (blue), yielding an ultraviolet pulse of light streaming from the companion star's location. For brief periods, Type Ia supernovae can outshine an entire galaxy of billions of stars. Now, a longstanding mystery about the tiny stars that let loose these cataclysmic blasts might finally be solved. Astrophysicists want to understand the origins of supernovae because they are integral to the evolution of galaxies and the study of dark energy. Evidence has squarely pointed to "white dwarfs" as the source of these cosmic blow-ups. White dwarfs are the aged remnants of stars like our sun that have contracted into a dense, compact balls about the size of Earth. Yet for decades, whether one white dwarf, or two, is needed to spark a Type Ia supernova inferno has remained frustratingly unclear. Two recent studies now offer perhaps the strongest evidence to date that both scenarios are valid, though the evidence hasn't been easy to come by. Because supernovae are typically so far away, researchers must forensically work backwards from the explosion's aftermath to pinpoint its culprit star or stars. Now, armed with a new theory about Type Ia supernovae and aided by a fleet of modern telescopes, astronomers have shown that these stellar explosions can occur under more than one set of circumstances. The Kavli Foundation spoke with four astrophysicists about the significance of nailing down the causes of Type Ia supernovae for learning more about the dynamics of stars, galaxies and the universe, on its grandest scales. Andrew Howell, a staff scientist at Las Cumbres Observatory Global Telescope Network (LCOGT) and an adjunct faculty member in the physics department at UCSB. Howell coauthored several recent papers on Type Ia supernovae suggesting single and double white dwarf scenarios are responsible. Daniel Kasen, an associate professor of astronomy and physics at the University of California, Berkeley, and a faculty scientist at the Lawrence Berkeley National Laboratory. Kasen developed the intriguing "shock-wave theory" used in the two recent papers, one of which he coauthored, that helped astronomers determine what triggers Type Ia supernovae. Laura Chomiuk, an assistant professor in Michigan State University's Department of Physics and Astronomy. Laura Chomiuk's radio-wave astronomy research uses the Expanded Very Large Array to study the stellar conditions that lead to Type Ia supernovae. Laura Chomiuk: It's about understanding one of the ultimate mysteries about stars. When our Sun dies, it's going to be a carbon-oxygen white dwarf, basically a big diamond that's going to cool and sort of fade into oblivion. But something in the universe makes one percent of white dwarfs commit suicide and explode as supernovae . We are only now starting to have an idea of what causes this. A.H.: Supernovae tie together so many areas of astrophysics. For example, if you're interested in how galaxies evolve, the energy from a supernova can locally change the star formation in a galaxy by dissipating the gas and dust needed to form stars. And when supernovae explode, their intense nuclear fusion creates the heavy elements that chemically enrich a galaxy. It's like the alchemy we were trying to do in the Middle Ages, but real and occurring naturally. In cosmology, we also use Type Ⅰa supernovae to better understand dark energy, which is one of the central mysteries in astronomy right now, or all of physics, really. Nearly seventy percent of the universe is dark energy. So that's the normal stuff in the universe. We're the weird stuff, and we still don't know what dark energy is. We want to make sure we get the workings of these Type Ia supernovae right so we're able to measure the effects of dark energy well. We rely on these supernovae as "standard candles" and use a portion of their light to calculate cosmic distances. Those distance calculations let us track how the expansion of the universe has changed over its history due to dark energy, so it's important we know just how "standard" our standard candles are. L.B. : Over the last ten years, we've gotten much stronger observational evidence that there are multiple scenarios that cause Type Ia supernovae rather than one. Recognizing that multiple paths lead to these events, I think, has really opened up the theoretical ideas about how these explosions unfold and been extremely healthy and exciting for the field. Andrew Howell leads a group of scientists specializing in supernovae and dark energy research at Las Cumbres Observatory Global Telescope Network (LCOGT) and the University of California, Santa Barbara. A.H.: Previously, we all thought there was just going to be one scenario for Type Ia supernovae. We would find it, then we'd all go home and that would be the end of it. But now we're starting to see that there are many different ways to make a Type Ia supernova. L.C. : We live in a very lucky time from an observational perspective. That is due to both Mother Nature's cooperation and several wonderful new facilities and instruments. For example, in 2011 and 2014 we had a couple of Type Ia supernovae explode in nearby galaxies. Because these explosions were so close and bright, we were able to perform detailed tests on them. We've also gotten really good astronomical surveys up and running that are scanning the whole sky, so we've been able to discover Type Ia supernovae earlier, basically right after they explode. L.B. : We can find a lot of supernovae now thanks to robotic telescopes all around the globe, such as the intermediate Palomar Transient Factory and the Las Cumbres Observatory Global Telescope that Andy works on, which allows for rapid monitoring of these supernovae discoveries. Then we have satellites that can go and get ultraviolet and x-ray observations right away. For radio observations, we have the Expanded Very Large Array in New Mexico that Laura uses, and which was modernized in 2012. So we can probe all wavelengths of light at once now. Lastly, there have been advances in computing that allow us to create three-dimensional simulations of supernovae to test out theoretical models. So it's not just new capabilities but all these new capabilities working together that are allowing us to make such progress. A.H.: I think that summary is true for astronomy as a whole. We're developing new capabilities that are leading to big, big jumps in our understanding of whatever it is we're studying, including supernovae. Daniel Kasen: It's a little eerie. As a theorist, you're constantly developing ideas that seem a bit distant and abstract, almost like science-fiction. Then, suddenly, observers actually go out and bring home hard data. That's when you're reminded that what you're doing is connected to the real world. L.B. : It's a pretty rare time for theory because we are making predictions that are then tested on such short timescales. Historically, most theoretical work has not been strongly tested until long afterwards. Astronomy theorists are quite often, therefore, behind the observers in having a coherent picture of what is in fact out there in space. When we get ahead of the observer is when it's the most fun to be a theorist! Daniel Kasen's research in theoretical and computational astrophysics focuses on supernovae, neutron star mergers and other energetic, short-lived cosmic events. D.K. : It was basically a question of simple curiosity. People have discussed over the years whether companion stars could survive the blast from a nearby supernova explosion. But nobody had asked, "What would it look like to actually see that happen?" It must be pretty incredible to witness the debris from the supernova — which moves at over a million miles an hour — slam head-on into another star. So I did a back-of-the-envelope calculation to estimate how hot that collision would be, how bright it might be, and so on. Surprisingly, the collision turned out to be bright enough to be seen on Earth. That gave the observers an idea of what to look for. L.B. : I remember seeing Dan give a talk at a conference here at KITP back in 2009 on his theory and saying to myself, "This is obviously the right calculation," and "This must happen." It was clear that his theory was going to provide a new avenue for testing the different hypotheses about the scenarios that generate Type Ia supernovae. And that's what is now playing out. Dan's work is not just some made-up model. It's something you can really sink your teeth into. A.H.: That's exactly what I was going to say, Lars. The first time I heard Dan describe his theory, it just blew me away. I remember thinking, "Whoa, this is incredible—we can totally test this out." We quickly figured out, though, that the observations of supernovae we had on record weren't good enough. To test out Dan's theory, we needed to do new studies to catch supernovae really early on. That realization has driven a lot of our subsequent telescope and observation proposals, like the robotic telescopes that Lars mentioned, which capture supernovae right after they occur rather than days or weeks later. As new surveys have captured hundreds of supernovae, it's been great to finally see Dan's theory play out. TKF: What's still missing in our picture about Type Ia supernovae? Dan, what's still keeping you up at night? D.K. : For a long time the question about Type Ia supernovae has been, "Is it a single white dwarf exploding, or is it a merging of two white dwarfs?" Today, a lot of people feel like both things happen. But within each of those ideas, we are still not sure how the supernova goes off; how does the star gets ignited? Does it always explode or might it instead collapse into a superdense neutron star? Is the first spark of the explosion lit at the center as an accreting white dwarf is compactified, or is the star lit from the outside in, by igniting a fuse of accreted gas at the surface? Kavli Institute for Theoretical Physics (KITP) director Lars Bildsten has conducted extensive theoretical research on the physics of white dwarf stars and Type Ia supernovae. L.B. : It would be nice if there were a scenario we theorists could walk through with a fair amount of confidence that produces a Type Ia supernovae. I would say we're still not there, but we're getting closer. L.C. : We've seen supernovae go off very close by in other galaxies, but we would really love it if one went off right in our galactic backyard, here in the Milky Way galaxy. D.K. : With so many surveys happening, we're getting a very rich set of the "normal" Type Ias. But we're also really starting to probe the outliers, the unusual ones, and it could well be that some of those one-in-a-hundred weirdos will give us clues that will help unravel what's happening in the dominant scenarios. A.H.: We also need theoretical breakthroughs. There's a crisis in supernova rates. No mechanism really accounts for how many supernovae we see. Figuring that out will require a lot of theoretical work, and observations will help get us there. D.K. : People feel confident that it is either one white dwarf or two white dwarfs exploding. But within each of those scenarios there are many different pathways, so to speak. Take the two white dwarfs scenario. There are several different ways to initiate the supernovae. You might imagine the stars wound up on a head-on collision course and blew up right away. Or maybe the two stars orbited each other and gradually spiraled in and merged, forming a single super-massive star that then later exploded. It is almost certainly white dwarfs exploding, but there might be almost a dozen different ways to make that happen. L.B. : We have categorized these major different pathways consisting of one white dwarf or two, but each of these is kind of hard and has steps that we don't understand. That could be the biggest clue that we don't actually have the right pathway. But if we don't, I think we're much better prepared now for the surprise. L.C. : To reiterate what Lars just said, we're all prepared to be surprised. We're at this really cool cultural moment right now where people are very humble and open-minded. If you ask almost anyone if they feel like they really understand what's going on in a Type Ia supernovae, they'll say no. They'll say that the assumptions they've held for decades have been dashed by the wonderful observations and theoretical progress we've had in the last 10 years. Everybody's really open-minded and willing to go back to the drawing board. D.K. : At once, we know more than we've ever known about Type Ia supernovae, and we also know less than we've ever known about Type Ia supernovae.